Kadija and Dr. Sorrells at the warm-up track adjacent to the Olympic Stadium. Dr. Sorrells is helping her and her coach with her technique for throwing the javelin. Kadija, the first female athlete from Niger, is a 34 year old woman with four kids. She had just weaned her last child the day she left for London. Kadija has polio and no muscular movement below the hips. 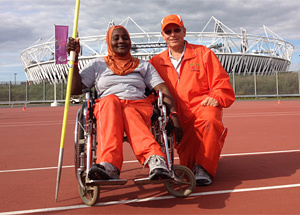 As the Niger sports medicine coordinator, Dr. Fred Sorrells had to take Kadija to the doctor in the Paralympic Village when she arrived due to chest discomfort. Dr. Fred Sorrells appears several times in this powerful video from Wheels for the World. 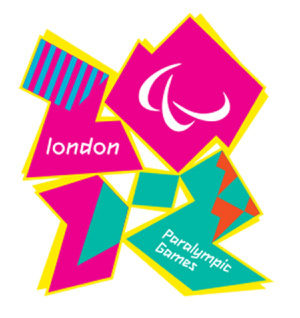 The London 2012 Paralympic Games, which opened Wednesday, August 29, 2012, was the biggest ever where Paralympic athletes competed in front of sold-out crowds and an estimated TV audience of around four billion. Dr. Sorrells served in his fifth Paralympic Games and as an official with the Niger, Africa delegation. 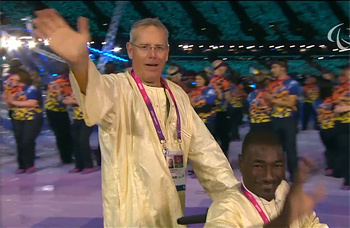 Dr. Fred Sorrells assisted a Nigerien athlete during the Opening Ceremony of the London 2012 Paralympic Games.